Brand New Album Release On Itunes Now In Stores, Suga Roy & Conrad Crystal Universal Tribute To Gregory Isaacs 18 Tracks Featuring Luciano and Fantan Mojah. Remaining consistent hitmakers, the duo has left an indelible mark and are indeed two exceptional artistes who have decided to unify their voices in their message-filled songs geared towards past, present and future generationsÃ¢â‚¬Â¦and they have been able to successfully bridge the generation gap, as they embark on their mission to spread reggaeÃ¢â‚¬â„¢s powerful message. 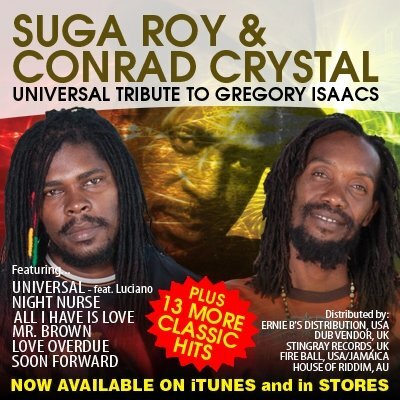 On June 28, 2011 Suga Roy and Conrad Crystal released there third album which is another great album paying tribute to Gregory Isaacs one of the greatest reggae legend, titled Ã¢â‚¬ËœSuga Roy & Conrad Crystal — Universal Tribute To Gregory IsaacsÃ¢â‚¬â„¢ featuring Fantan Mojah and Luciano on separate tracks.